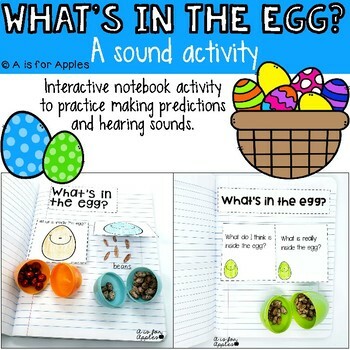 This interactive notebook activity is a hands-on way for students to practice making predictions and hearing sounds! This activity can be used during the spring, around Easter, or at any time in the year when you are teaching about the sense of hearing. Choose from different options on how to use the activity and different notebook flaps for students to use. 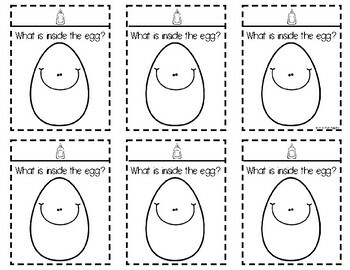 * Have the students shake the closed egg and make a prediction about what’s inside based on the sound if makes. 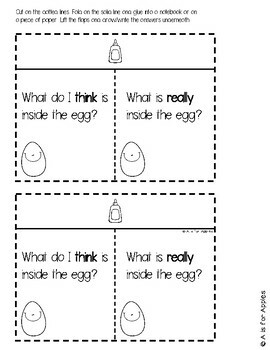 Students will lift the flap and draw/write what they think is inside the egg. * After they have made their predictions, students will open the eggs to find out what is really inside. They will lift the flap and draw/write what is really inside the egg. * Have the students shake the closed egg to hear the sound it makes. 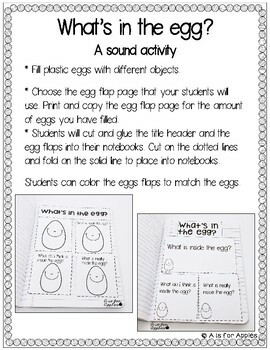 * Students will open the eggs to find out what is inside and lift the flap to draw/write what is inside. Students will love shaking the eggs and hearing the sounds while they are learning!